NCERT Solutions for Class 1 English Chapter 15 Sundari are part of NCERT Solutions for Class 1 English. Here we have given NCERT Solutions for Class 1 English Chapter 15 Sundari. This is a story of a big colourful kite named Sundari. It was made by a boy named Bobby. Bobby takes his big and beautiful kite, Sundari, to the fair to fly. Bobby started flying the kite in the sky. Suddenly, a dog caught the kite’s tail in his mouth. Bobby drove the dog away. And then the kite flew high in the sky as it wanted to go higher and higher in the sky through air. At last, Bobby had to leave it as she flew away. One day, Bobby took Sundari to the fair. where he could run and fly his kite. up his kite as high as he could. to her long tail. It was in his mouth. 3. Bobby shooed the dog away. “We’ll try again,” Bobby said. wanted Bobby to let go of her string! She gave a big tug. Bobby had to let her go. I feel dizzy on a merry-go-round. The band was playing a tune. The boy named Bobby made Sundari. Why did Bobby call his kite “Sundari’? बॉबी ने अपनी पतंग को ‘सुंदरी’ नाम क्यों दिया? He called it Sundari because she looked beautiful. Did Sundari fly very high at first? क्या सुंदरी पहली ही बार में बहुत ऊँची उड़ गई थी? No, she did not fly very high at the first time. What made Sundari really happy? वास्तव में सुंदरी किस बात से खुश थी? Sundari felt happy when Bobby let her go away high in the sky. क्या तुम्हें पतंग उड़ाना पसंद है? Yes, I like to fly kites. 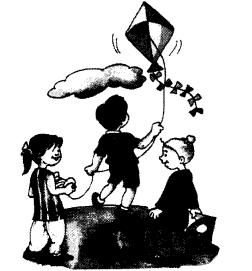 Who helps you to fly kites? पतंग उड़ाने में तुम्हारी सहायता कौन करता है? My brother helps me to fly kites. Tick the objects you need to fly a kite. Colour the kite. Name the objects in your own language. 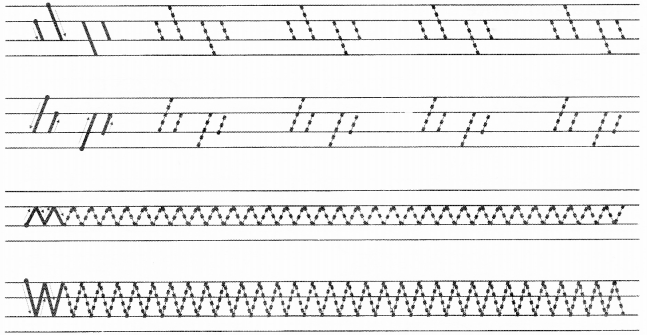 Trace over the dotted lines. Look at the picture and tell the story in your own words. It is a rainy day. A girl is walking on the road holding an umbrella. She seems very happy. Suddenly a crow came towards her and grabbed on umbrella and flew away. 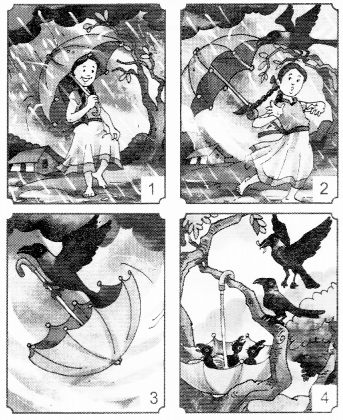 She became crow reached near a tree and hanged the umbrella on a branch, placed his chicks in the umbrella and saved them from the rain. Rearrange the following sentences in the right order to make it into a story on the left page. The crow flies away with the umbrella. The girl has an umbrella. The umbrella is now a nest. The umbrella hangs from a tree. 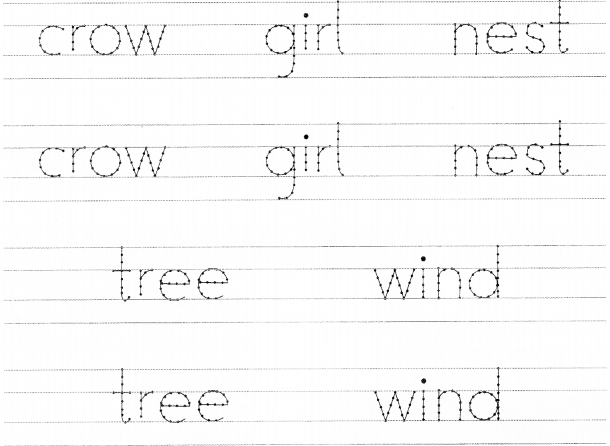 Now say the story in English using the words rain, wind, crow, nest, is, has blows, flies. We hope the NCERT Solutions for Class 1 English Chapter 15 Sundari will help you. If you have any query regarding NCERT Solutions for Class 1 English Chapter 15 Sundari, drop a comment below and we will get back to you at the earliest.